Provide a valuable and innovative new solution to your customers. InfoAktiv gives you a very easy way to add innovative new products and services to your portfolio. It addresses several of today’s key issues and enables customers to take full advantage of the latest communications techniques and media. Implementing InfoAktiv opens up important new opportunities for both you and your clients – a genuine ’win-win’. The easiest way is to start by working with us as an agent. You make the introductions, we do the rest, and we pay you an agency fee. If you want to become more deeply involved we will be delighted to provide complete sales, marketing and technical support. Just decide which elements of the InfoAktiv solution you want to provide (hardware, services etc.) and we can take care of the pieces that you prefer to leave to somebody else. We provide as much support as you need through all stages of the marketing and delivery process. Training and skills transfer to your sales and technical people. Co-branded sales and marketing material. Joint marketing and lead generation campaigns. Joint sales calls and product demonstrations, either in person or live over the internet. 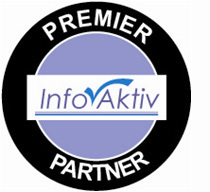 Technical support for you and your clients to set up and deliver InfoAktiv solutions. We will work with you in whatever way is best for you. Agency agreements – The quickest an easiest option. You introduce us, we do all of the work, we pay you an agency fee. Reseller agreements – Suitable if you want to take on more of the work and responsibility for delivering and supporting InfoAktiv solutions. Rental companies – Partner with InfoAktiv to drive extra rental business by adding an attractive new service to your portfolio. You provide whichever elements of the service you want to and we can take care of any pieces you prefer to outsource. Typically an AV rental company will provide the hardware, InfoAktiv provides the software and we share the services work. Hardware manufacturers and resellers – Package InfoAktiv ’s software with your hardware, to create complete solutions. The latest opportunity is to create an off-the-shelf ’digital brochure rack’ by bundling the new Express software. Significant volume discounts are available. Software integration partners – If you provide software that is complementary to InfoAktiv let’s talk about how we could work together. We can license InfoAktiv software to you if you want to add functionality such as electronic literature distribution to your own solution. Games and other promotional applications to run on InfoAktiv systems. Advanced survey or data collection features. Graphic designers and content creators – We are constantly looking for talented partners who can help to set up InfoAktiv systems and create great content, either for their own clients or for those of other partners. Contact us if you are interested in becoming a partner or associate. InfoAktiv partners range from one-man bands to some of the largest marketing services companies in the world. What matters most to us is that you add value to the customer. We recognize that individuals with great relationships and reputations to maintain can contribute just as much as big corporations.